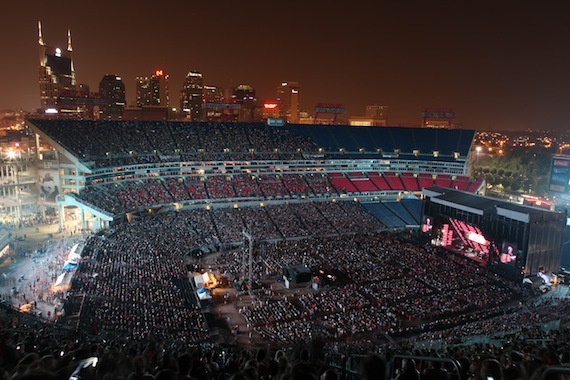 Tickets for the Nightly Concerts at LP Field sold out a record-setting six weeks in advance of the 2013 CMA Music Festival. Demand for four-day ticket packages means single night tickets will not be available for the LP Field concerts, running June 6-9. Artists previously announced to perform include Gary Allan, Dierks Bentley, Luke Bryan, Eric Church, Kelly Clarkson, Florida Georgia Line, Hunter Hayes, Lady Antebellum, Miranda Lambert, Little Big Town, Jake Owen, Brad Paisley, Blake Shelton, Taylor Swift, The Band Perry, Carrie Underwood, Keith Urban and Zac Brown Band. Recently added are Kip Moore, Lee Greenwood, Tracy Lawrence, The Oak Ridge Boys and Randy Travis. Set to perform the national anthem are Brett Eldredge, Gloriana, Lorrie Morgan and Pam Tillis. Attendees can find free music throughout downtown Nashville with non-stop performances. Lineups for stages including the Chevrolet™ Riverfront Park Stage, the Bud Light Stage at Bridgestone Arena Plaza, Transitions Performance Park, The Buckle Stage on Broadway, BMI Tailgate Party and more will be announced soon through CMA’s social networks. CMA Music Festival’s newest attraction is the AT&T U-Verse Fan Fair X (FFX) at the Music City Center featuring three stages, celebrity Q&As, a red carpet, Fan Fair X Marketplace, and Country music memorabilia. It opens Thursday, June 6 with “Lady A Day at FFX” featuring Lady Antebellum. FFX tickets are $10 a day or $25 for four days, children 12 and under will be admitted free. In 2012, CMA Music Festival attracted more than 71,000 daily visitors. Direct visitor spending for the event totals more than $31 million annually according to the Nashville Convention and Visitors Bureau. CMA Music Festival will once again be filmed for a national television special to air on the ABC Television Network and will be executive-produced by Robert Deaton. Visit CMAfest.com for ticket details.